May 2018 84 www.sportseventsmagazine.com Small Markets...Big On Sports! 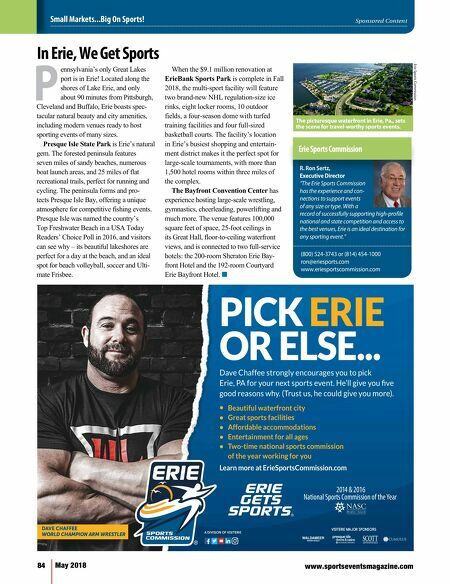 Sponsored Content PICK ERIE OR ELSE... VISITERIE MAJOR SPONSORS: A DIVISION OF VISITERIE DAVE CHAFFEE WORLD CHAMPION ARM WRESTLER Dave Chaffee strongly encourages you to pick Erie, PA for your next sports event. He'll give you five good reasons why. (Trust us, he could give you more). • Beautiful waterfront city • Great sports facilities • Affordable accommodations • Entertainment for all ages • Two-time national sports commission of the year working for you Learn more at ErieSportsCommission.com 2014 & 2016 National Sports Commission of the Year ennsylvania's only Great Lakes port is in Erie! Located along the shores of Lake Erie, and only about 90 minutes from Pittsburgh, Cleveland and Buffalo, Erie boasts spec- tacular natural beauty and city amenities, including modern venues ready to host sporting events of many sizes. Presque Isle State Park is Erie's natural gem. The forested peninsula features seven miles of sandy beaches, numerous boat launch areas, and 25 miles of flat recreational trails, perfect for running and cycling. The peninsula forms and pro- tects Presque Isle Bay, offering a unique atmosphere for competitive fishing events. Presque Isle was named the country's Top Freshwater Beach in a USA Today Readers' Choice Poll in 2016, and visitors can see why – its beautiful lakeshores are perfect for a day at the beach, and an ideal spot for beach volleyball, soccer and Ulti- mate Frisbee. 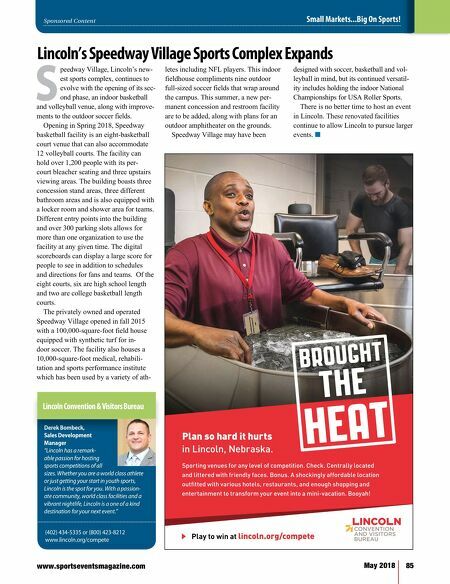 When the $9.1 million renovation at ErieBank Sports Park is complete in Fall 2018, the multi-sport facility will feature two brand-new NHL regulation-size ice rinks, eight locker rooms, 10 outdoor fields, a four-season dome with turfed training facilities and four full-sized basketball courts. The facility's location in Erie's busiest shopping and entertain- ment district makes it the perfect spot for large-scale tournaments, with more than 1,500 hotel rooms within three miles of the complex. The Bayfront Convention Center has experience hosting large-scale wrestling, gymnastics, cheerleading, powerlifting and much more. The venue features 100,000 square feet of space, 25-foot ceilings in its Great Hall, floor-to-ceiling waterfront views, and is connected to two full-service hotels: the 200-room Sheraton Erie Bay- front Hotel and the 192-room Courtyard Erie Bayfront Hotel. n P In Erie, We Get Sports R. Ron Sertz, Executive Director "The Erie Sports Commission has the experience and con- nections to support events of any size or type. With a record of successfully supporting high-profile national and state competition and access to the best venues, Erie is an ideal destination for any sporting event." Erie Sports Commission (800) 524-3743 or (814) 454-1000 ron@eriesports.com www.eriesportscommission.com Erie Sports Commission The picturesque waterfront in Erie, Pa., sets the scene for travel-worthy sports events.